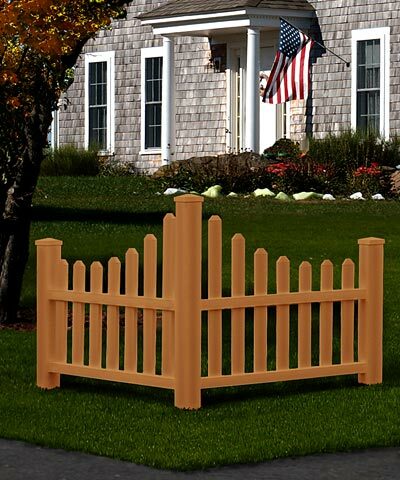 Enhance one corner of your yard or the end of your driveway using this New England Country Corner Picket Fence. This striking, angled fence brings a rustic hint to your yard, while helping define the space or showcase new plants. Three square, upright posts form the frame, and handily support two horizontal rails on each side. Routed holes on these slats accommodate the included pickets, which decrease in length toward the ends for a bold effect. The brown color and wood grain finish on this unit enhance its rustic appeal, while the blend of recycled wood pulp and vinyl provides durability with little maintenance. A pyramidal endcap on the three upright posts lends extra height and style to the item, and each of the rails locks into place for a sturdy fence. Its unique construction offers the look of wood with the low maintenance of vinyl, and the brown hue enhances your landscaping. Define a corner of your yard easily with this Country Corner Picket Fence. Assembly required. Ten year warranty.